Looking at the skull’s eye sockets, Hamlet sees staring back at him the decay of his fondest childhood memories, a literal, face-to-face encounter with his own mortality. Shakespeare’s Globe Theatre On Tour,Folger Theatre, Washington, D.C. This lean and trimmed production of Hamlet, first staged at the re-created Shakespeare’s Globe Theatre in London, England, is intended to replicate the spirit, if not the actual look and style, of an English Renaissance acting company on tour. After it traveled through Great Britain and to Spain and Austria this summer, the troupe has takenup a short two-week stay at The Folger in Washington, D.C. While the project has some academic underpinning—aside from, of course, this being Hamlet, only the greatest piece of fictional literature in Western Civilization—the production seeks first and foremost to entertain its audience, just as the players touring the original production of Shakespeare’s Hamlet had to do. And entertain, this production, and the play, certainly does. 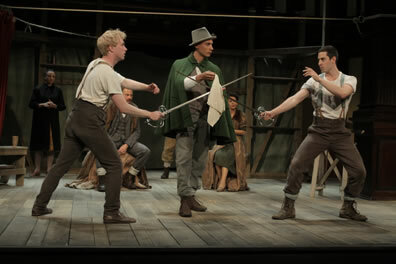 Hamlet (Michael Benz, left) and Laertes (Matthew Romain) await the signal from Osric (Peter Bray) to begin their fencing bout in the Shakespeare Globe's production of Hamlet at the Folger Theatre. Watching from their stepladder thrones are Claudius (Dickon Tyrrell) and Gertrude (Miranda Foster). Photo by Carol Pratt, Folger Theatre. Rather than Elizabethan clothes, the eight actors look as if they were farmers and residents of a northern England village in the mid–20th century gathering at the community hall. Even as the audience takes its seats in the Folger Theatre, the actors come and go on the stage, lacing up boots, hanging up coats and props, tuning their instruments. Some move out to mingle with the audience. After a quick preshow speech, noting that, as the original production was staged in the open-air Globe, they would be leaving the house lights on, the company launches into an song and stomp dance that quickly segues into the play’s opening scene with Francisco, Marcellus, Bernardo, and Horatio on the Elsinore battlements. Stepladders and planks serve as settings: boards arranged on the floor are the castle walls; stepladders side by side are the thrones; the stepladders separated to either side of the stage are the doors to a room; stepladders supporting boards arranged in a rectangle are Ophelia’s grave. As the scenes transition, actors reposition the props in cadence to the lines being spoken. Fluidity is the operative word here. The production moves along at a fast clip, and not only because of the trimmed text (those who know the play well will miss lines, but for the most part the cuts are not noticeable). Scenes overlap as the players merely exchange coats and hats to become different characters: Tom Lawrence as the Player Clown walks behind a curtain and, without breaking stride, emerges a few steps later on the other side as Horatio. The dialogue is also quickened. You can adjust to the rapid conversations and grasp the storyline and character developments well enough, but some of the play’s good jokes get lost in the speeding traffic of words, especially from Hamlet (Michael Benz). Christopher Saul plays Polonious for laughs, but he doesn’t always pause for those laughs before he’s on to his next line. It’s surprising that the actors don’t allow more of Shakespeare’s original jokes to register because they are intent on making this a fun and funny play, beyond the dotage of Polonius and the lapwing flourishes of Osric (Peter Bray). Rosencrantz (Bray) and Guildenstern (Matthew Romain) arrive in Elsinore over-burdened with suitcases and swinging badminton rackets, and upon meeting Hamlet, the three conclude their Fortune-is-a-strumpet bantering with a silly fraternal handshake, indicating they have definitely been social buddies in the past. Claudius (Dickon Tyrrell) bumbles his way through statecraft and step-fatherhood. He doesn’t merely mix up Hamlet’s pair of friends, he mangles their names, calling them Rosenblat and Gugenheim at first and then Rosenbland and Gugencrantz later. The First Gravedigger (Saul) departs not just to get a “stoop of wine” but to get a bottle from the bar in the Folger Library lobby. In this and other ways, such as posture and formal gesturing, the actors incorporate some commedia dell’arte conventions into their playing. Benz as Hamlet in particular behaves like a self-conscience comedian, even before he converses with the Ghost. Benz makes an intriguing entrance in his first scene. After the stage has transitioned from battlements to royal court and the rest of the cast is hurrying about like courtiers preparing for the arrival of the royal party, Hamlet walks on and steps up onto the stepstools that would become the thrones. He seems more angry than distraught, and when Claudius and Gertrude (Miranda Foster) enter, Hamlet steps to the front of the stage and spends the rest of the scene—until the king addresses him—in disinterested disdain. Let’s not forget that Hamlet should have succeeded his father as king, but the election somehow fell on Claudius (marrying the queen certainly helped). The rest of the production does not make much of this aspect of the play, but the hint is there at the beginning. Because of his almost egomaniacal behavior and an air of “I’m sooooo much more clever than the rest of you” hovering about his persona (which he notably drops when he’s interacting with Horatio), Benz’s Hamlet is not a character the audience easily warms to. His overstated ironic posture, in the face of the calamity he knows is about him, is more irritating than insightful. Even his soliloquies come across as geeky meanderings. The play speed-skates along in a merely entertaining way to the Mousetrap, and at that point, this Hamlet elevates into something special. For one, the Mousetrap is ingeniously staged. Royal court takes their places as Hamlet pulls a curtain across the stage, leaving only him, Ophelia (Carlyss Peer), and Horatio on the outside. After Hamlet banters with Ophelia, he draws the curtain and the royal court is now the players (Tyrrell and Foster doubling as the Player King and Player Queen) treating us to a brilliantly choreographed and performed dumb show that’s something like rhythmic claymation. The Murder of Gonzago begins with the queen’s speech protesting way too much that she will never ever remarry. Though not clearly stated, the suggestion I got watching this dialogue and recalling the Players’ preparations beforehand is that this is the speech of “some dozen or sixteen lines” Hamlet inserts into the play. Hamlet closes and reopens the curtain to once again reveal the royal court, Claudius looking more confused than bothered, Gertrude clearly angry. Another drawing and opening of the curtain returns us to the Player King sleeping in the garden and Lucianus pouring poison into his ear. The whole while, Horatio has been off to one side, looking toward the back of the Folger Theatre. He’s been eyeing Claudius, per Hamlet’s orders, and Horatio clearly reacts to the Claudius's reaction before the latter with Gertrude comes roaring down the theater’s center aisle, putting a stop to the play (cool sleight of hand at work here to have the Player King and Claudius on stage at the same time). Even with the Ghost’s account, Horatio’s observation is the first and only evidence we get that Tyrrell’s Claudius could have killed anybody (Claudius’ confessional aside earlier in the play is cut from this production). But in the next scene in his closet, Claudius erupts with “O, my offence is rank, it smells to heaven,” and this admission is so effectively sprung upon us as to be gasp-worthy. The production’s tone has shifted. The political intrigue heightens, the psychological stream deepens. When the Ghost (Tyrrell) appears in Gertrude’s closet, he shows genuine affection for his widow queen; she, though, doesn’t see him. Commentators have long wondered why this is so when the Ghost not only appears to Hamlet but at the start of the play to Horatio and the guards. Scholars and Hamlet, though, are not the only ones baffled by this twist from Shakespeare; Tyrrell’s Ghost is, too. He looks surprised that Gertrude doesn’t see him, and so, dejected, he turns and departs. 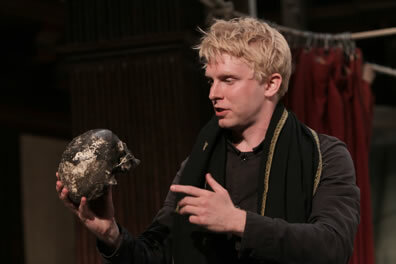 Michael Benz as Hamlet addresses poor Yorick in the Shakespeare Globe's production of Hamlet at the Folger Theatre. The cast speeds through much of the play, including Hamlet in his soliloquys, but here he brings great poignancy to this famous speech. Photo by Carol Pratt, Folger Theatre. Hereafter, Benz’s public Hamlet becomes shrewder while his private Hamlet becomes more seriously self-reflective. These two traits merge profoundly in the Yorick speech. Hamlet picks up the second skull the gravedigger places on the side of the grave and jokes that could be a lawyer or banker; in fact, it turns out to be Yorick’s. Learning this forces Hamlet into a true sadness we’ve not seen in him the whole play as he tries to reconcile the jester he loved so well and last saw when he was seven years old with this decayed, smelly skull in his hand. Looking at the skull’s eye sockets, Hamlet sees staring back at him the decay of his fondest childhood memories, a literal, face-to-face encounter with his own mortality. His next encounter with love loss is literally right around the corner as the body of Ophelia is being carried to the grave. The play’s pace slows in the second half, and we can better appreciate this cast’s acting talents, from Benz as Hamlet to Bray as Rosencrantz, Marcellus, Fortinbras, and Osric, from Foster’s overwhelmed Gertrude to Foster’s quirky turn as the Second Gravedigger, from Tyrrell’s bumbling, blustering Claudius to Tyrrell’s majestic Ghost. Romain, in addition to a sweetly innocent Guildenstern as well as Bernardo and Lucianus, flourishes as Laertes. Genuinely earnest in his care for Ophelia and duteous to his father at the beginning of the play, this Laertes has every justification upon learning of his father's murder to return from Paris so hell-bent on revenge. Seeing Ophelia’s madness visibly deepens his grief; and yet, he maintains a heroic nature even as he plots Hamlet’s covert assassination. Romain strikes a deep emotional chord responding to the news of his sister’s drowning: “Too much of water hast thou, poor Ophelia, and therefore I forbid my tears. But yet, it is our trick; nature her course holds, let shame say what it will.” Shakespeare was always fond of writing heroic eulogies as expressions of grief, but as Romain let flow real tears after saying he would forbid them, these lines become an aching knell. This production offers up no concluding morality. After Fortinbras stakes his claim to the Danish throne and orders the salute for Hamlet, Peer appearing as Ophelia re-enters as a dance strikes up and, one by one, raises Foster, Tyrrell, Romain, and Benz for a final jig. Shakespeare’s own productions ended with dances, and this traveling troupe of players, remember, is here to entertain. They do that well. If along the way their play resonates deep in our subconscious, well, they do that well, too. My reaction to this production was very similar to yours. I enjoyed the first half, in a mild pleasant way, but once the play-within-the-play began, I thought the production really took off. I'd never seen the second half of the play register with such urgency and such a clear sense of violent chaos, with all characters in a state of emergency. This created an interesting contrast with Hamlet's much more placid and resigned state of mind on his return in Act V.
Richard—You make an interesting point about Hamlet's state of mind upon his return. It somehow emerges even in the letter to Horatio (I'm still not sure how actors pull off such subconscious effects). As it contrasts so much with Benz's portrayal of Hamlet in the first half, I assume this was all intentional, a psychological theme that rather than Hamlet, it was Elsinore that was in a fragile state of mind.